England and Scotland have both been fined by European governing body Uefa for failing to control their fans during recent Euro 2016 qualifiers. The English Football Association has been fined 15,000 euros (£10,768) over crowd disturbances in the 3-0 victory in Lithuania earlier this month. The Scottish FA must pay 20,000 euros (£14,355) after home fans invaded the pitch during the draw with Poland. Poland and Lithuania were also punished for the behaviour of their supporters. Uefa have ordered the Polish FA to pay 40,000 euros (£28,721) after their fans clashed with stewards during the 2-2 draw at Hampden Park on 8 October. The Polish supporters also lit fireworks and threw other objects during the match, which ended Scotland's hopes of reaching the Euro 2016 finals. The Lithuania Football Federation has been fined 30,000 euros (£21,541) for crowd trouble, blocked stairways and for limiting fans' movement during the visit of England on 12 October. 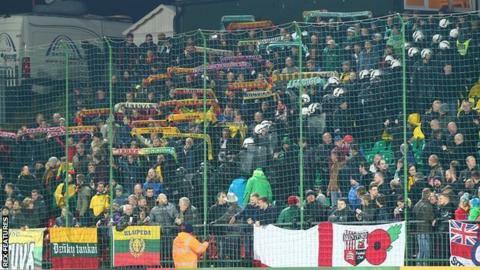 Riot police quelled skirmishes between rival fans behind one of the goals just before kick-off in Vilnius. An English FA statement, released after it was charged by Uefa on 14 October, said the incidents had not taken place in the area where fans who bought tickets from the FA were located.